The Notre Dame fire is heartbreaking. As I type this and repost my painting of the rear of Notre Dame, I'm watching the TV coverage of the ongoing fire which has destroyed the spire, and led to the collapse of the roof. We first visited Notre Dame in 1970, and still remember the organ concert from that Day. We almost never visited Paris without entering Notre Dame. 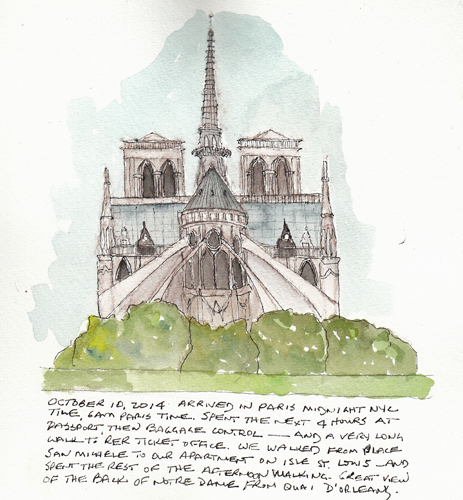 On our most recent visit in 2014, I spent an hour on a beautiful sunny October day sketching Notre Dame from the quay on Ile St. Louis. This is heartbreaking. Commentators and city officials are currently describing the role of the ceiling in holding up the stone walls. They are beginning to wonder if the cathedral can be saved.